This optional status on the left bottom of the C64 screen shows the working status of the actual running CBM-serial device. The optional number shows the actual accessing track number on the disc (floppy only). 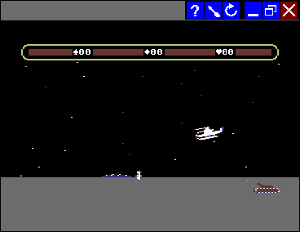 A purple colored icon indicates that the fast loader is operating. A yellow icon indicates a saving operation on disk. You are able to select multiple d64 disks in the "Open File" (F10) dialog. These disks are now selectable with the "Disk Box" menu item and are saved into the snapshots also. If you like to have additional floppy drives just press one of F8-F11 key for a disk entry in the "Disk Box". The C64 Emulator supports networking playing! One of the players have to start the server - configuration "Network" - "Game Host Server". All others are connecting to this server by activating the network client -> configuration "Network" - "Join a Game". A game server will be found in a private network automatically. For an internet server input the server ip. Please be aware to open an existing firewall on UDP Port 35272. The first connected player is the "main" player (usually the server) and it's actually loaded game is automatically loaded to the others. So there is no need to pre-share the games to the others.